Skerricks: [headdesk! ], then blushes and says Thank You! 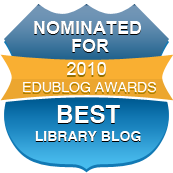 Thank you for whoever nominated (and voted for) Skerricks in the 2010 Edublog Awards! Very kind of you, and most appreciated. To be selected for the shortlist in such august (international) company (go read that list for some fabulous library/librarian blogs!) is a great honour. That page will link you to the winners and the nomination list (Dopey Dora here didn't realise until, like, now, like, when it's all over and finalised!! - although mid-December last year, the end of term and the school year, was a tad busy...).